An art exhibition by Margaret Ramsay about Be-longing! Longing to be! We all need to belong, to have a close connection with others and to be accepted “just as we are”! 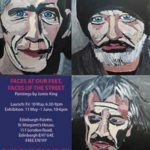 Artist Jamie King has produced portraits of homeless people in Edinburgh, painted from photographs taken with agreement from each individual. Part of the Mental Health Festival 2019. 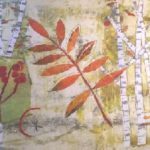 Monoprinting for stitch is a fun workshop to learn some easy textile art skills. It’s aimed at patchworkers, quilters and aspiring textile artists and crafters. If you’ve not tried Mono-printing, then you’ll not know what you’re missing. But take it from me, it’s a whole heap of fun and it’s much easier than it looks. It’s a great way of creating your own designs to inspire embroidery and collage. So if you like quilting, patchwork or any form of fabric craft, then why not give it a go? It’s also a really quick way of creating decorative papers for cardmaking. 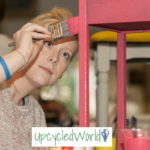 Firstly, I’ll show you how to make your own mark-making tools and printing blocks using everyday items. I love to use ‘found’ objects from nature, such as feathers and leaves. These unique marks will enable you to totally personalize your work. Then I’ll demonstrate various mono-printing techniques to create colour and pattern on paper or fabric. You will then spend some time creating your own collection of printed materials (papers and/or fabrics). Finally, we’ll look at how colour and pattern can inspire stitch. You can use hand or machine embroidery to further embellish your work. You could collage or piece your fabrics together to produce a totally unique cushion, bag or wallhanging/quilt. This class will free you from having to buy commercial printed fabrics. It will add a whole new dimension to your work. It’s the easiest way to learn how to design your own unique artworks. 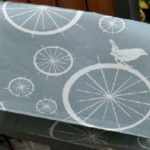 When you come to Mono-printing for Stitch and see how easy and fun it is to make your own gorgeous collage materials, you won’t want to buy fabric ever again. Finishing like a pro! Would you like to learn how to finish any hand-knitting project with finesse? 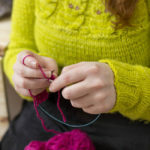 Book your place to learn the best techniques that will give your knitting a truly professional finish – seaming, sewing in ends, picking up stitches, buttonholes and blocking and pressing. To get the most out of the class, it’s a good idea to have some knitting that’s ready to be sewn up. If you have just completed a garment or accessory please bring it along and we can discuss the best way of finishing it. Please note payment is required to book in to this workshop, and is non-refundable.